If you like it - share it - spread the word about shipping! Alisdair Pettigrew has 15 years experience of working in the markets where marine, energy and environment meet. He is co-founder of BLUE, a communications’ consultancy, whose mission is to bring new strategic intelligence to reputation management in industries that must alter perceptions of their economic and social value. He came to communications from a successful decade in journalism and as publisher with Informa and Petromedia. 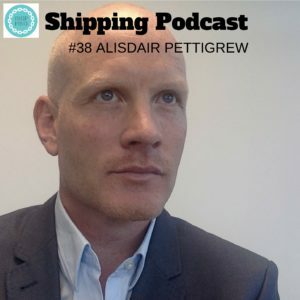 Alisdair is has been a senior advisor to Sir Richard Branson’s Carbon War Room NGO’s shipping operation for over five years, and is an advisor in Clean Marine Energy, a company dedicated to providing tailored solutions for emissions compliance. He combines outstanding media and opinion former communications skills with the rare ability to originate and develop new vehicles for ideas, research and evidence on compelling issues to give clients ground-breaking opportunities through many channels. He is also the founder of news and information website SustainableShipping.com, and maritime publishing and intelligence company Fathom. He is a founder and equity partner in Mayfield Corporate Ventures, whose mission is to invest in entrepreneurs seeking to develop solutions where the marine energy and environment markets meet. Would you like to join the mailing list?